They only laugh at your tin foil hat because they don't know the truth! 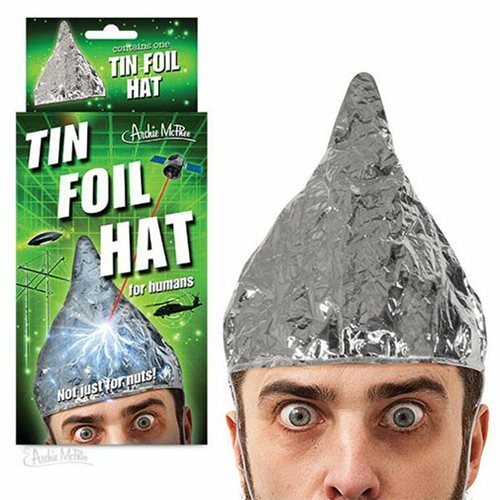 One of the most irritating parts of being under constant, long-distance electronic thought observations is having to make a new tin foil hat every day. This mylar hat fits most adult heads, and comes with a felt lining and an elastic strap to hold it in place. You'll look stylish under the most harsh psychic assault attempts that "they" can throw at you! When we wore it to the grocery store, we noticed 20% less mind control and lots of jealous stares. Illustrated box. Ages 13 and up.